Angel food cake is a sponge made using only the egg whites. It originated in the United States and gained its popularity in the late 19th century. It was named Angel food cake because of its white, fluffy, light and delicate texture. According to information I found on The Old School Pastry, Jessup Whitehead, an American pastry chef, gives the ratio for this cake as follows: a pound of sugar (453 grams), a pound of egg whites (453 grams), half a pound of flour (226 grams), an ounce (28 grams) of cream of tartar. A couple of weeks ago (on the 10th of June), it was my Husband’s Birthday. Between cooking classes, I prepared the French buttercream ahead and made an Angel Food Cake with the leftover egg whites and also used some, which were already in the freezer. The cake was flavoured with bitter almond. The mixture was divided into two small baking tins and each one was cut into two pieces. For the Filling and decoration, I used half of the above French Buttercream, which I combined with white chocolate and whipped cream and coffee flavour. Finally, I decorated it with edible gold leafs and chocolate shavings. On medium speed, using a stand mixer, whisk the egg whites with the salt and lemon juice, until foamy. Meanwhile sift the sugar and flour separately and weigh them. Combine both. Preheat the oven to 180oC (170oC fan forced). Add the granulated sugar and bitter almond essence and continue beating increasing the speed until the egg whites become stiff. Turn your mixer to the lowest speed and add half of the sugar and flour mixture. Turn off the mixer and gently fold the remaining mixture using a spatula. Line two 18 cm / 7-inch baking tins with parchment paper and divide the mixture. Bake for 30 – 35 minutes, or until a knife inserted in the centre comes out clean. Prepare the whipped cream (no sugar added) and refrigerate. Melt the white chocolate over a double boiler. Set aside to cool until lukewarm, mixing every now and then. Bring the French Buttercream to room temperature and using a hand mixer, start adding the chocolate and mixing. Add the coffee essence and mix. Finally, add the whipped cream and mix until incorporated. Refrigerate for half an hour before adding it to the cake. ⇒ Add some cream between each layer. ⇒ Cover with the remaining cream and decorate as you wish. 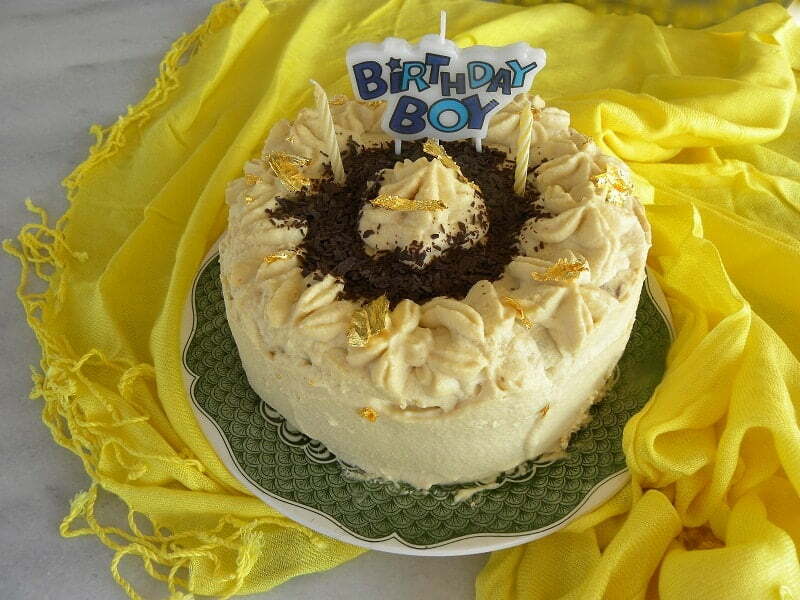 ⇒ I used a star shaped tip to decorate, I added some chocolate shavings and finally decorated with edible gold leafs. Add some cream between each layer. Cover with the remaining cream and decorate as you wish. I used a star shaped tip to decorate, I added some chocolate shavings and finally decorated with edible gold leafs. Beautiful! The edible gold leaves make this layered cake even more beautiful and tempting. The crumb of angel food cake is perfect. You didn’t use all the layers? Thank you Angie. I did use all the layers. Those in the background are something else I made.